by Brianna Crandall — October 5, 2018 — Victory Innovations, manufacturer of what the company calls “the world’s first and only” cordless electrostatic handheld sprayer, just announced it is giving away $500,000 worth of its sprayers as a part of its “Keep Kids Healthy” initiative. The initiative was established to help public schools prevent the spread of flu and other viruses through access to better tools for their disinfection protocols. Every year, 38 million school days are lost due to influenza, and 22 million are lost due to the common cold. Students are absent more than four days a year on average, and chronically absent students are seven times more likely to drop out of school. Teachers are absent for more than five days per year on average, accounting for a loss of more than $25 billion in school budgets annually. While we all hope this flu season is a mild one, we’re grateful for the opportunity to help schools take preventative measures to keep kids and teachers healthy. With our patented sprayers, schools can quickly implement a critical line of defense against harmful germs and viruses. The Victory Innovations sprayers feature electrostatic technology that provides an electrical charge to solutions, allowing them to wrap conductive surfaces with more efficacious and even coverage. There is no need for school personnel to touch or wipe surfaces, reducing the risk of cross-contamination. The sprayers will allow schools to apply disinfectant in classrooms, gyms and on buses without the hindrance of a power cord, additional cleaning tools or downtime for treatment to take effect. They also require 65 percent less disinfectant per square foot and can be applied 70 percent faster than traditional application methods, saving schools critical time and money, says the company. The Keep Kids Healthy giveaway is open to US public school districts and is limited to one free sprayer per district. The first 625 school superintendents to submit an application will receive a Victory Innovations Professional Cordless Electrostatic Handheld Sprayer. For more information about entering the giveaway and to read the full rules, visit the company’s website. 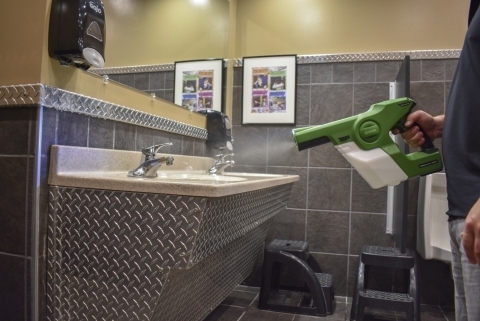 Victory serves professionals responsible for maintaining healthy spaces with a focus on sanitization, decontamination, pest control and odor control. Need to prevent or get rid of wood pests or mold? Check out Flo-X’s new wood pesticide and mold wipes May 30, 2018 In "Products and Services » Cleaning Equipment & Supplies"